I really appreciate all of you that still visit my blog in spite of all of the "dry spells". It's a drizzly day here to the point that it looks foggy out. It's a perfect day to spend in the sewing room. You've seen this quilt here on my blog before. I had it quilted last year by my long arm quilter. It is made of red and white string blocks. You can see the heart motif that he put in the border. Below is the drawing from my Electric Quilt file. You can see the breakdown of the blocks a little easier. You can make the string blocks any size that you want. Here is the link to my string block tutorial. You can also get there from the tab under my header. My blocks measure 8 inches, but you could make them any size. 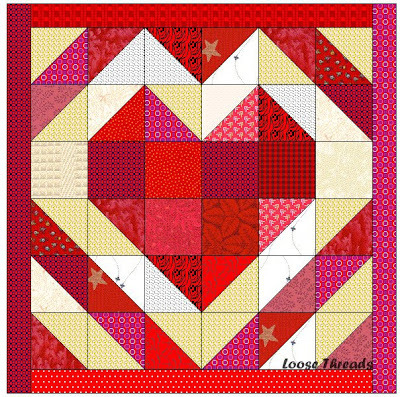 I know it's too late for this year, but if you are in a Valentine mood you could start today and have the quilt finished for next year. Here's a better look at the string blocks in the center. I used any and all reds. The whites range from pure white to creams, and I even used some shirting pieces. I love the photo below. It was taken at my husband's family farm. This was taken before it was quilted. Here is a smaller version using 3 inch (finished) blocks. This is a table topper size and finishes at about 18 inches. You can find my tutorial on how I made this table topper in my blog post here. It includes more on how to piece the string blocks and cut them into half square triangles. Here is a close up of one of the string blocks. I quilted this after watching Leah Day's Heart Paisley video. I love her videos because she does her example on a square, and she shows you how to get on and off of that square and fill the entire area. She has lots of videos on line if you just search. 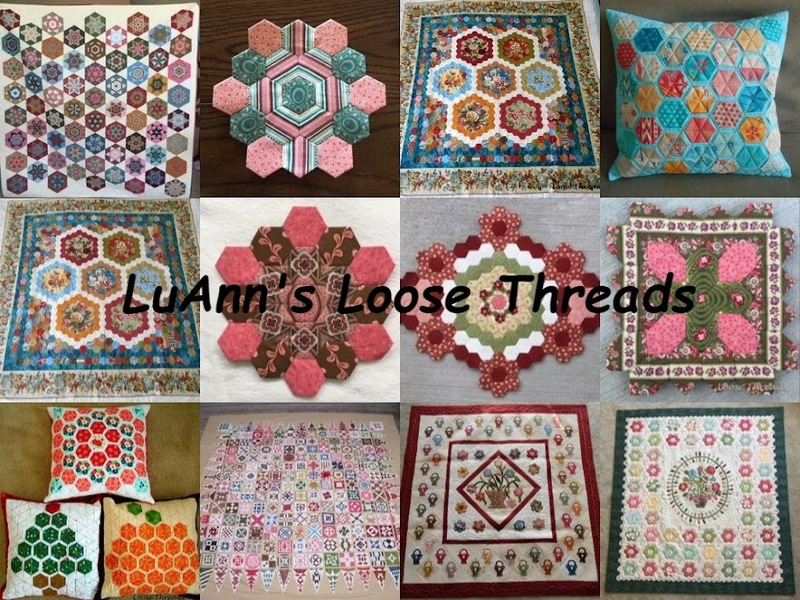 Here is the same table mat using 3 1/2" unfinished squares and half square triangles. You can find more detail about this version of my table topper in my blog post here. Here is the pattern for the table mat drawn in Electric Quilt. 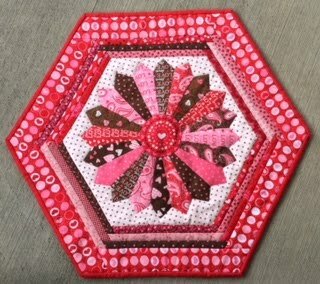 The pattern for this little Valentine quilt and the Valentine table topper pictured are both available for sale in my Etsy shop. The little quilt below fits on a wire table stand. I have one of the Sunburst Dresden Table Toppers for every season, and there is one in the center of my table all year. The patterns are also available at Back Door Quilts. I'm not sure what the Valentine plan is, but I bought each of us one of these. I thought this was a better option than having a whole box of chocolate here . Are you all watching the Olympics coverage like I am? There is not only the network coverage, but there is a cable channel that covers some live events. It's NBCSN. The problem with that is the time difference, so to watch you have to sit up into the wee hours of the morning because they won't let you record on that channel. So I'm a bit sleep deprived, but I'm getting some stitching done in the evenings. Writing this blog post is like back in the day when we wrote snail mail letters back and forth with a friend - days before we had email. The letters came every week at first. Then they came every other week, and then eventually it ended up that those weekly letters turned into a form letter stuck in a Christmas card. I think when you write less often, it is harder to figure out where to start. That's where I'm at today. I didn't plan to be gone for so long, but I've had two bouts of the flu since Thanksgiving. Both times I ended up with an infection and an antibiotic. I'm trying to take it easy and slow down......some. Right before I got sick this last time after Christmas, I pulled everything that wasn't nailed down out of my sewing room which is the room that should be our guest room. It is about 11' X 12'. I put everything out into the entryway, great room, and on the table and that is where it stayed until recently when I began to feel better. I was going to start with a blog post with those photos, but I lost my nerve. So I decided to start with the quilts that I finished in 2017 instead. This is my version of Brinton Hall. The pattern was published in Quiltmania magazine No. 82. Here is a closer look at the center. Instead of the applique' flowers in the pattern, I chose to do broderie perse flowers, and I added some embroidery flowers and leaves. This center was so much fun that I was kind of sad when I had finished it. This quilt is just something I made up. I still love making string blocks. Here is a link to the string block tutorial on my blog. You can also find it in the tabs under my blog header. This quilt was machine quilted by Paul WyCoff. This is my Lucy Boston Patchwork of the Crosses quilt. I finished these 16 blocks, sewed them into this small quilt, and machine quilted it on my home machine. I still have more block kits prepped so who knows where they will end up. You can find my tutorial here on how to fussy cut your Lucy Boston blocks so the outside round forms a square. That link is also under my blog header. Here is a small part of my 2" six pointed diamond quilt. When there is a sunny day, I'll take a photo of the entire quilt because I don't think I blogged about it since I finished it. It was just finished this past year. This was quilted by Paul Wycoff. Brinton Hall is one of my favorites because I love hexagons. It is another pattern from Quiltmania magazine 107-108. The original pattern called for a row or more of blocks around the hexagon center. I believe they were star blocks. I liked the quilt just as it is, and I liked the border with it. This was quilted by Paul Wycoff. This is a quarter Dresden blade pillow I did with embroidery in the sashing. I just made this up and plan to write a pattern with the pillow and the quilt in the next photo. The quilt is a Dresden Hourglass. I really enjoy using the Easy Dresden ruler. I hate to think of how many years I had that ruler sealed up in its package before I ever opened it and made my first Dresden. Now it's hard to stop. I quilted this one myself. This twisted bargello has been in my stack of UFOs for several years. It was there mostly because I didn't know how to quilt it. So one day I just basted it and started quilting. I made this by reading through a pattern I bought years ago, looking at a pattern in a magazine, and I ended up just doing my own thing. I sew with a group downtown on Thursday mornings. We try to do a group project of some sort each year. Last year we did Gypsy Wife. Everybody did the blocks they wanted and as many as they wanted. Some people substituted other blocks for ones they didn't want to do. I had a bag of half square triangles so I substituted those. This is my version. I machine quilted this one. The pattern for this quilt is from Pacific Rim Quilt Company. These two color quilts are a manageable size and are a lot of fun to hand applique'. You just pick a color of thread that works and stitch. The background is a creamy yellow fabric hand dyed by my friend, Val, from Canada. I machine quilted this one. 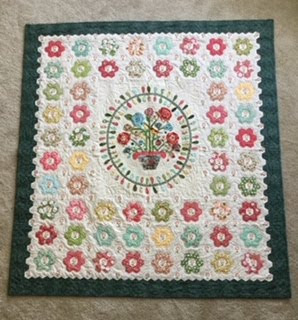 I like to echo quilt, and these flowers seemed like a good place to do that. Here is another quilt that was in the UFO pile for a lot of years. I believe this is from a book by Gai Perry about 1995 called Impressionist Quilts. This quilt is made of all squares that finish at 1". These were all put on a design wall and sewn together individually. I machine quilted this one. This is Alletaire the Bonnie Hunter mystery quilt from 2016. It was machine quilted by Paul Wycoff. This is a photo of the finished top. I love the design he did in the border. Talkin' Turkey is another Bonnie Hunter pattern. I did the top over a year ago. It was started in a Bonnie Hunter class that I took over in Cincinnati with my friend Michele. What a fun time we had! Here it is quilted although you can't see a lot in this photo. This quilt is in Edyta Sitar's book Friendship Strips and Scraps. I like this quilt. No, it didn't use up much of my stash at all. Album Quilts of Miami Valley. There were four of us that worked on our own version of this quilt and shared ideas and blocks and motivated each other. Karen, Cathy and Lori and I had fun doing this project and sharing our progress on our blogs. Karen even drew several of the blocks and shared her original designs. Paul Wycoff quilted this with an all over Baptist Fan design which works well with these blocks. This is my version of Holly and Mistletoe from the Blackbird Design book When the Cold Wind Blows. The original quilt had a couple of applique' blocks in the center and the vase of holly was off center. I like symmetry, so I put the vase in the center and left out the other two blocks. The original border is all appliqued', but I've had this red and green fabric in my stash just waiting for the right quilt so I used it for the border. Here's a closer look at the center. It is all hand appliqued'. Brown ground chuck and finely chopped onion. Drain fat. Add the rest of the ingredients and cook until desired thickness. Reduce heat and simmer to blend the flavors. That's it for now. I'll try not to stay so long next time.